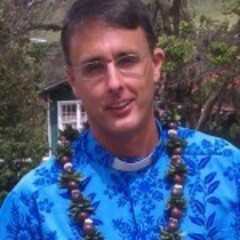 Father David was called to be Priest-in-Charge in October, 2011. He completed his seminary education at the Divinity School at Duke University and his Anglican Studies year as Seminarian in Residence at Canterbury Cathedral. He was ordained in 1997 in the Diocese of East Carolina. There he served for three years as Curate/Assistant Rector at St. Paul’s Church, a pastoral-size congregation in the historic seaside town of Beaufort, North Carolina. He then served for four and a half years as Associate Rector for Member Incorporation at the corporate-size congregation of St. Bartholomew’s Church in the heart of mid-town Manhattan. Most recently, he served for seven years as the Rector of Trinity Church in Asbury Park, New Jersey. The vision which guides his ministry is the belief that because we are made in the image of God there is inside of each of us a hunger to connect with the Sacred. Our aim as the church is to help people make that connection as we grow both in numbers and in depth of relationship with God and one another. He believes the Episcopal way of living out the Christian faith offers a spirituality and way of worship many are seeking, but have yet to experience. He has a passion for exploring ways our parish can reach out to meet people where they are, sharing with them what we have found, as well as maintaining and growing in ways we seek to care for another as a parish family. He feels strongly that worship can be reverent as well as joyful, welcoming and accessible, especially to children and youth. He believes that worship should encourage people in their daily lives and send them out lifted up, empowered by the Spirit to meet the week ahead.